The landmark says a lot about the town. 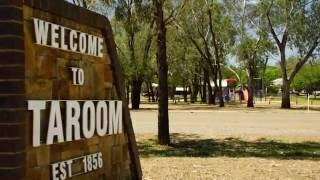 Taroom is steeped in early European history and built on primary industries – first sheep, now cattle and grain. The region opened up to settlers in the 1840s with the northern exploits of early explorer Ludwig Leichhardt. The good doctor took a liking to the place while camped by the Dawson River, carving his initials and year date – LL 1844 – into the bark of a coolabah tree. The initials long since gone – in somewhat controversial circumstances – the tree still stands pride of place in the main street, which is as it happens, the Leichhardt Highway. A pleasant walk up the hill takes you to Gilbert’s Lookout, named after Leichhardt’s companion who met a violent end here. Across town in Yaldwyn Street, Leichhardt Park is the site of Leichhardt’s memorial. The park is dedicated to the region’s native flora with weeping bottle brush, flaxleaf paperbark, lemon scented gum, swamp mahogany and bloodwood found throughout the grounds. The exception is a single Aleppo Pine, seeded from Lone Pine on the Gallipoli Peninsula.